A series of car bombings across Iraq today killed at least 56 people and wounded dozens as the government continued its efforts to combat extremism across the country. The largest bombing took place in the Shiite-majority town of al-Khales in Iraq's eastern Diyala province. At least 32 people were killed in the attack and 58 were wounded when the car bomb tore through a commercial street, a police official said. In July, Diyala was the scene of one of the deadliest attacks on Iraqi soil in almost a decade when a suicide bomber with the Islamic State group attacked a crowded marketplace, killing 115 people, including women and children. The province, parts of which were previously under the Islamic State group's rule, has been the scene of multiple attacks in recent months prompting anti-government protests, with citizens demanding tougher security measures. Meanwhile, in Iraq's southern Basra province, a senior security official said a car bomb exploded in the busy commercial district of a suburb near the city killing 10 people. Jabar al-Saadi, head of security for Basra province, said the bombing happened in the town of al-Zubair today, 50 kilometers (31 miles) southwest of Basra. At least 25 people were wounded in the attack. 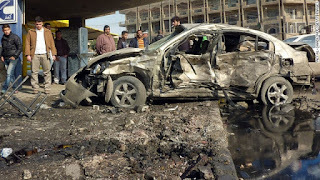 In the capital, Baghdad, police said at least 14 people were killed and 25 wounded when a car bomb exploded in the northeastern neighborhood of Husseiniya. Hospital officials corroborated the death tolls. The officials spoke anonymously as they are not authorized to brief the media. While no one has claimed responsibility for the attacks, the Islamic State group regularly targets Shiite neighborhoods and government installations in an effort to destabilize the Shiite-led government in Baghdad. Associated Press reporter Nabil al-Jurani in Basra, Iraq contributed to this report.